The new challenge word at BITW to use on your page or other project is 'WISH'. You have one month to complete your project in order to be in the running to win a kit from Tidbitz In Time. 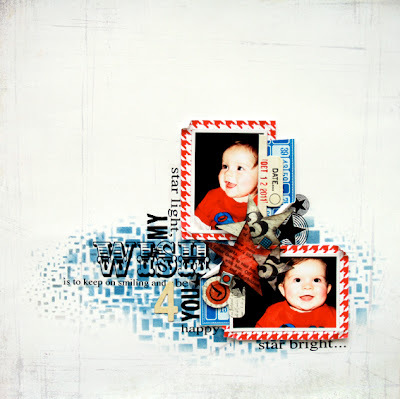 I used The Crafters Workshop new mini Cubist template which is a perfect design to just add that little extra bit of interest without being too defined, love it, love it, love it and also used some of the PP's from Pretty Little Studio and their 'Antique Store' collection. You can get your hands on these little pretties at Handmade Halo! what a beautiful pics and beautiful page Em!!! Have a fabulous week ahead! Another WONDERFUL Layout Miss EM!!!! oooh awww.. another little ripper!! Oh Em I just absolutely love this! The entire lo is amazing! So eye-catching!